Mass media, comprising of newspapers, magazine, radio, television, and social media has played an important role in shaping American politics over the years. Recent political issues along with the election of Donald Trump as president have pushed the opinions of liberals and conservatives even farther apart. 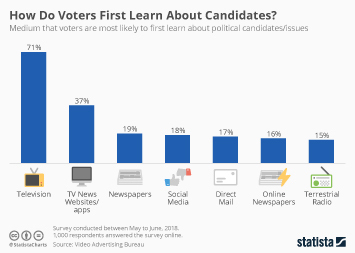 As the parties have become more combative, their constituents have followed suit, and, as always, leading political media outlets report stories that appeal to the interests of their specific audiences. These massive differences of opinion lead to lower public trust and confidence in news media, which only further alienates the two groups from each other. The man at the center of nearly all political media discussions is current U.S. president Donald Trump. The many questions regarding his election, personal finances, and alleged ties to the Russian government have left his enemies calling for impeachment and his allies claiming a political “witch-hunt”. Whether accurate or biased, only around 11 percent of news stories give positive assessments of the Trump administration. Over 80 percent of Republicans believe that the media treats President Trump unfairly, compared to just 13 percent of Democrats, but one thing that most people seem to agree on, regardless of political affiliation, is that the relationship between Trump and the media is generally unhealthy, and that this tension impairs Americans’ access to important political news. Although media houses are expected to be accurate and unbiased, many Americans have come to distrust the media’s reporting on political news and events. In a 2017 survey, 43 percent of Republican respondents considered the media an enemy of the American people, while 33 percent Democrats believed the media to be an ally. The concept of “Fake News” is central to this belief. Over 50 percent of Americans believe that fake news is a significant problem, with 67 percent of respondents stating that they believe that they personally encountered fake news stories online during the 2016 presidential election. Various social media outlets such as Facebook and Twitter seem to be hotbeds for the propagation of fake news stories, mostly due to their lack of oversight and fact checking. The relationship between media and politics in the U.S. appears to be at a breaking point. One thing that is very clear is that media outlets must go to greater lengths to ensure the fairness and accuracy of their coverage in order to retain the trust of their viewers. Topic: Fake news in the U.S.
Topic: Cable TV in the U.S.